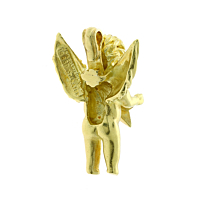 Crafted in rich 18k yellow gold, this charming angel pendant by Kieselstein Cord is both simple and unique. By pairing this pendant with your favorite silk cords and beaded chains, you can create a variety of looks for every occasion while creating a signature piece that is uniquely you. The vintage look of this pendant adds to its magnetic appeal. 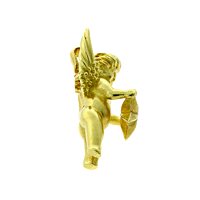 Kieselstein Cord's gold angel pendant makes an unparalleled gift for collectors of angels or vintage designer jewelry.